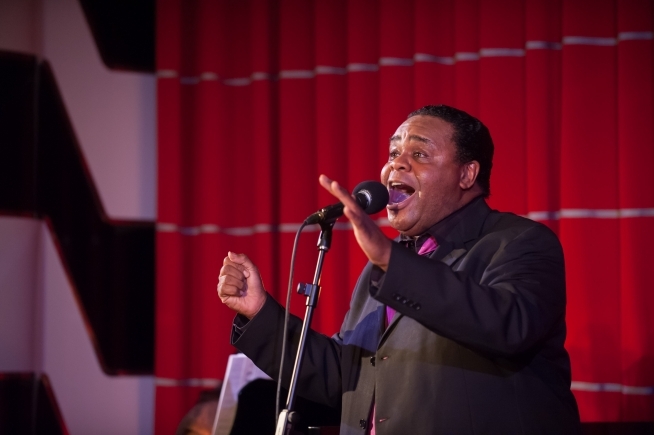 Much loved award-winning musical artist Clive Rowe opened his solo show last night at one of London’s new jazz/cabaret rooms – The Crazy Coqs at Brasserie Zédel. More about this venue later. Named after a cockney barmaid at the Adelphi Theatre where Clive worked Front of House, Rose’s Front Stalls Bar depicts his career from those humble beginnings to the star of the West End he is today. It seems Rose always loved to hear him sing and would invite (or command!) him to entertain the audience in the bar just before the show and during the intervals. His songs, needless to say, were frequently interrupted by the Front of House 3-minute calls – which became a running joke throughout the evening. The programme is a collection of songs he either sang for Rose – or wished he had. Clive is renowned for his big powerful voice, but it should be noted that his quieter ballads too are very beautiful. Some of the most poignant moments of the evening were “Moon River” and an affecting medley of songs made famous by Adele. A sensitive performer, he adapts the power of his voice to the intimacy of the room, so that even belt numbers such as “Broadway Baby” are not overwhelming. And he got everyone going with a great version of “Putting on the Ritz”. Clive’s patter became more fluid as the evening progressed. What would make this lovely show even better is a tighter structure, particularly in the first half, and better use of the song lyrics themselves to tell his story. The best link was for the introduction to a musically interesting medley of “A Foggy Day” and “A Nightingale Sang”. However, his clear expression of those lyrics, combined with that superb command of voice, made for a delightful evening. Clive Rowe is an excellent choice to launch the official opening of this new venue. It is a truly stunning Art Deco room; originally part of the Regent Palace Hotel, and now painstakingly re-created from original architectural drawings. Cabaret is presently experiencing a long-overdue revival in London, and this magnificent space deserves audience support. 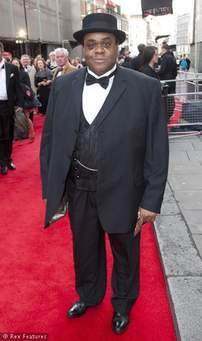 What better way than to see Clive Rowe? This entry was posted in Cabaret Reviews and tagged Adelphi Theatre, Brasserie Zedel, cabaret, Clive Rowe, fiona jane weston, London cabaret, London Cabaret venues, Rose's Front Stalls Bar. Bookmark the permalink.